So When I get my Mac I will be set for a memory upgrade. I have in the past written about Google Reader. It has received a needed update that has taken it to a whole new level. I have been of late getting tired of the river of news format, and have secretly hoped Google would do something about it. I tried tags and reading a feed at a time, but Reader was just to cumbersome. Now post redesign all I can say is Nice, and I won’t be going anywhere else to read my feeds anytime soon. via Kottke.org. An interesting view on how we live. Why do we have so many meetings that have few observable results? Under communication creates over congregation. We have so many meetings because the participants spend a great deal of time and effort removing ambiguity and aligning expectations. The ambiguity and misaligned expectation are the symptoms of to little communication. Face to face communication is rich and powerful but it is expensive, requiring parties to be present at the same point in time and space, and has a limited scope of accountability. There are techniques to increase the accountability of people who use face to face communication as a primary communication mechanism. Techniques like formalized follow-up and written recaps create artifacts of the communication. The lack of communication in any organization forces people to seek the richest form of communication. Over communication is key to reducing the number of meetings and managers must be conduits for and facilitators of communication. I found that when I feel like I am communicating to much, I am really just communicating enough. So over communicate you might find that you have fewer meeting and become more effective. 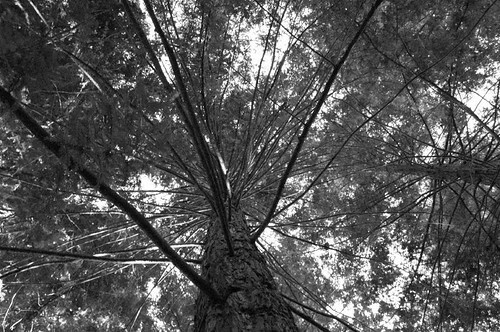 Redwood tree, originally uploaded by dfarber. I just get lost in this picture. enjoy.